A fun reminder of what should be put in your recycling bin. 1. Gather your material. 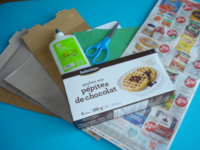 You will need empty cereal boxes, white glue and/or hot glue, adhesive tape (not shown), scissors, grocery store flyers, two sheets of green construction paper, white cardboard, and a rectangular box. 2. 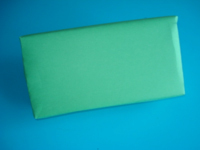 Use the green construction paper to wrap the rectangular box. 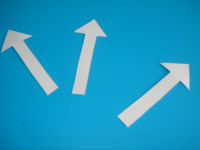 Use white glue or adhesive tape to stick the paper on the box. 3. Cut three arrows out of the white cardboard. 4. 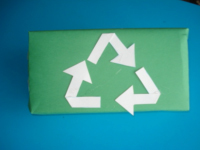 Fold each arrow and arrange them on the face of the rectangular box to represent a recycling logo as shown. 5. 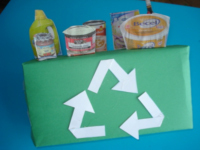 Cut various items with recyclable containers (glass bottles, plastic containers, cardboard boxes, metal cans, etc.) out of the grocery store flyers. 6. 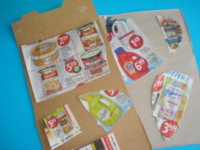 Glue them on the open cereal boxes. 7. 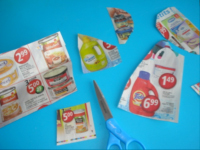 Cut them out, leaving a few extra centimetres at the bottom of each item. 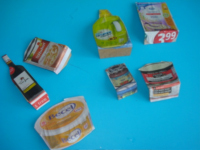 Fold these bottom sections back and use them to glue the items on the top of your rectangular box. 8. 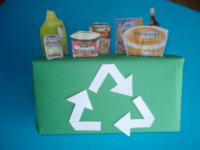 Arrange the items on the top of the box, bending them back so they remain standing up to make it look like they are sticking out of your recycling bin. 9. Set your miniature recycling bin next to your actual bin. 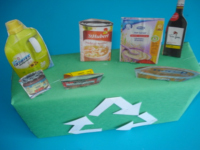 Children can use it to determine which empty containers can be recycled.